BTC/USD locked in a short-term range. Element Asset Management analysts say Bitcoin may grow higher. Bitcoin is changing hands at $7,460, off the Asian low reached at $7,358. 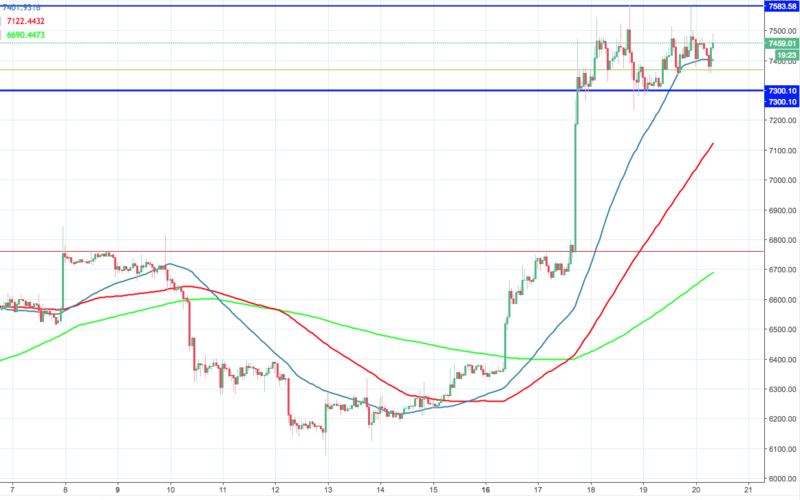 The coin climbed back above 50-SMA (1-hour chart); however it is yet to conquer $7,500 handle to unlock the way to recent high. Looking technically, BTC/USD is sitting in a range limited by $7,580 on the upside and $7,300 on the downside, A sustainable movement in either direction will define the short-term momentum for the digital currency No.1. If the support gives way, the sell-off may be extended towards the critical $7,000, which will become the first signal that the recovery may be over. To confirm the creation of a new bullish trend the price needs to go past $7,600 and, probably, $7,860 (50% Fibo). Analysts from Element Asset Management believe that Bitcoin is currently undervalued and has a room to grow. “All in all, we believe that when we see signs of price drift that it indicates that the current price may not be the fair value price. All the information that is relevant may not be fully priced in,” Thejas Nalval and Kevin Lu wrote in a note to clients. Considering that positive fundamental news are not fully reflected in the price, Bitcoin still have a potential to go much higher from current levels.